Psychedelic spiral coil ring by Lynn Ban Jewelry. Sterling silver coiled band and pavé settings. 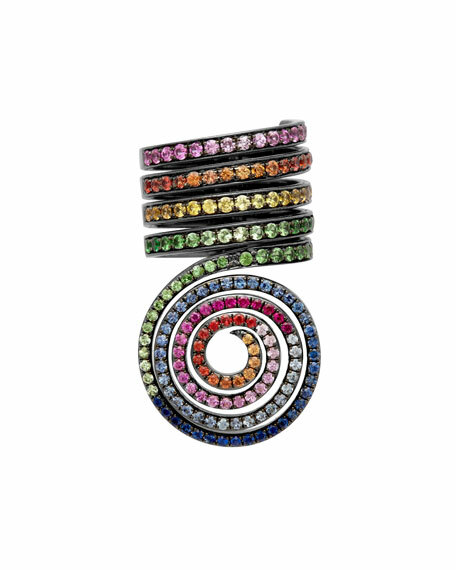 Mixed blue sapphires, tsavorite, orange sapphires, pink sapphires, rubies and yellow sapphires. 0.76 total tsavorite carat weight. 0.73 total pink sapphire carat weight. 0.69 total blue sapphire carat weight. 0.63 total orange sapphire carat weight. 0.39 total yellow sapphire carat weight. 0.11 total ruby carat weight. For in-store inquiries, use sku #2478071.